The highly polished brass finished instruments will never tarnish or discolor. 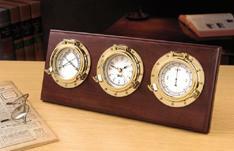 A battery, an engraveable brass plate, mounting hardware and a lifetime warranty are provided. Dial: 2-1/2". Base: 14-1/2" W x 6" H.